(Dec. 11, 2017) -- A recent spinout from The University of Texas at San Antonio (UTSA), Leaptran, Inc., is bringing to market products that will optimize whole building energy use while providing room-level comfort for individuals. Using artificial-intelligence and smart building features, these integrated hardware and software products will optimize energy use among micro-grid distributed energy resources (DERs) such as solar power generation and battery energy storage systems (BESS). Leaptran’s technologies are licensed from UTSA and are based on co-founder and UTSA Assistant Professor Bing Dong’s more than ten years of research in building energy efficiency, occupant behavior, big data analytics, intelligent building operation and optimization, measurement and verification, and buildings-to-grid integration research. Recent UTSA Entrepreneur-in-Residence and energy storage expert, Jeff Xu, founder of Leaptran, identified and evaluated these technologies and recognized their synergy with his skills as a great commercial opportunity. Leaptran has launched at full speed. Through UTSA, the Leaptran team received a $50,000 award to participate in the National Science Foundation’s Innovation-Corps (I-CorpsTM) program to optimize their product and market development focus. 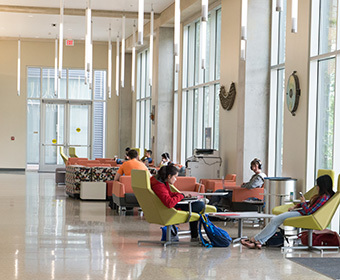 As a UTSA New Venture Incubator member, they then landed a SBIR Phase I award of $149,991, funded by the Department of Energy’s Office of Energy Efficiency and Renewable Energy (EERE) through the Small Business Innovation Research (SBIR) program. In addition, Leaptran now has a contract in place with UTSA and CPS Energy to explore micro-grid-level energy optimization and the deployment of distributed energy resources intelligently. Buildings consume more than 70% of total electricity usage in a city. Leaptran’s energy management with predictive control (EMPC) for buildings and micro-grid will integrate sensing, energy optimization, machine learning, and behavior analysis. Their technology aims to reduce wasted energy in a building up to 50%. This efficiency will reduce both the electric bill and greenhouse-gas emissions. To help buildings and micro-grids incorporate more renewable and distributed energy resources, Leaptran’s products will balance increased load demands and integrate building energy management. Battery energy storage unlocks the potential for battery in buildings and allows the grid to maximize renewable and distributed energy sources. With its intelligent capability, Leaptran’s solution can as well be adapted to a smart micro-grid solution. "This is a great example of taking basic research outside of the laboratory and creating a practical application to tackle real world challenges which will benefit society. By bringing together our in-house research expertise with our regional entrepreneur network, we can develop solutions for the marketplace," said Christine Burke, director of Commercialization and Technology Transfer at UTSA.